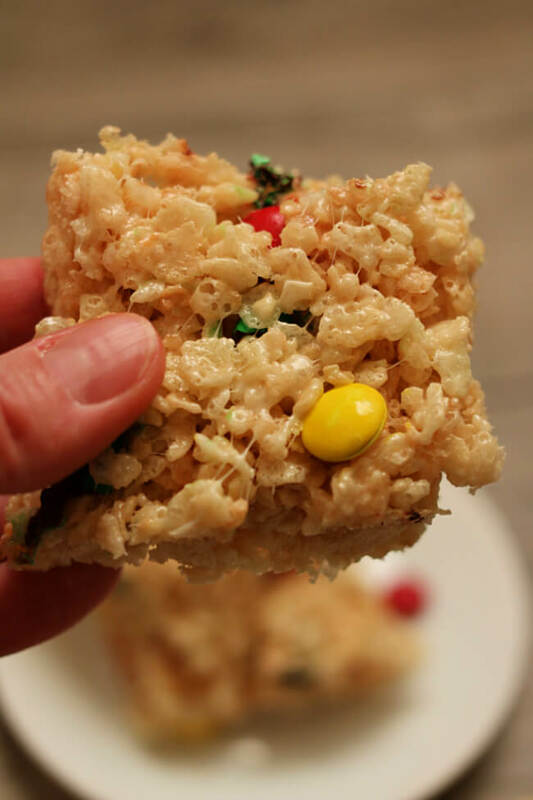 Instant Pot Rice Krispy Treats –use your Instant Pot’s saute function to quickly make a double batch of rice krispy treats. Stir in some m&ms to make them even better. This week for my weekly YouTube video I decided to have a little fun. While these Instant Pot rice krispy treats might not be the most groundbreaking recipe they are still super yummy. My son joined in the fun for this video too. Make sure to watch until the end for all his outtakes. The pot is big enough you can easily double the recipe and the marshmallows will all fit. This is especially true if you have an 8 quart pot. Sometimes the marshmallows get too puffy and crazy in the microwave…do you know what I’m talking about? You can easily clean up the stickly marshmallow pot afterwards by warming up water in it with the saute function. Once the water is hot you can easily scrub off the marshmallows. Add in M&Ms or other leftover Halloween candy. Just stir in the candy (chop up the candy bars) with the rice krispies. They’ll make good rice krispy treats even better. Use fresh marshmallows. 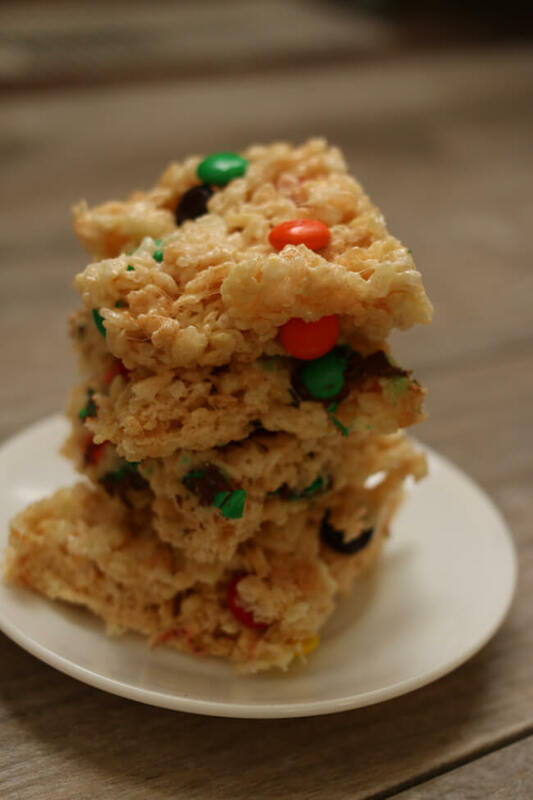 If you use stale marshmallows the rice krispy treats will be harder than you like. Store the leftovers in an airtight container so they don’t get hard. Sometimes I put a little piece of bread in with them. This keeps them soft. Sort of like what happens when you put a piece of bread in with brown sugar. Use half cocoa krispies and half rice krispies. Or get creative with other types of cereal like fruity pebbles. 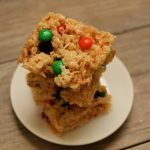 To make Instant Pot Rice Krispy Treats I used my 6 quart Instant Pot Duo 60 7 in 1*. I love this Instant Pot because it has the yogurt making function which I use almost weekly. It has two pressure settings (high and low), and there are also little slots in the handles so that you can rest the lid there instead of putting it down on your counter-top. Use your Instant Pot’s saute function to quickly make a double batch of rice krispy treats. Stir in some m&ms to make them even better. Once the pot says HOT on the display add in the butter and stir it until it melts. Once it is melted stir in the marshmallows. Stir until the marshmallows are melted and coated with butter. Remove the inner pot from the Instant Pot. Turn off your Instant Pot. Stir in the rice krispies and M&Ms. Pat the mixture into a buttered 9×13 inch pan. Let them sit for 10 minutes and then you can cut them and enjoy! Store leftovers in an airtight container. This recipe is easy to double. Just double all the ingredients and keep the other instructions the same. To make gluten free: Malto meal brand of crispy rice is gluten-free and delicious! Use that as a substitute and you’re good to go! 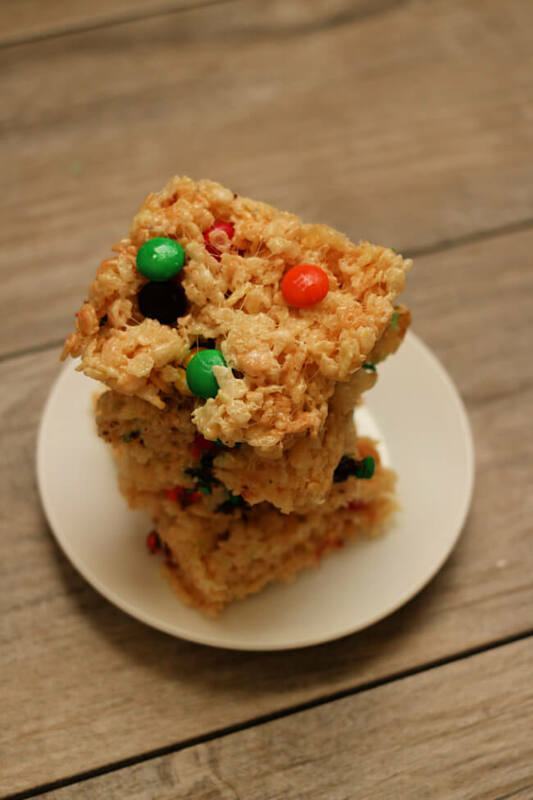 Like this recipe for Instant Pot Rice Krispy Treats? Get all my new recipes delivered to your email inbox by signing up below. You did a fantastic job on the video! Your mom is a good teacher. You could be a great chef someday! How long ahead of time can you make and store these? Recently I learned that you can freeze rice krispy treats! So wrap them up tight in plastic and freeze until ready to deliver. Do you have recipes for the 3qt size instant pot? Mostly you can halve my recipes and they’ll turn out great in the 3 quart. You can also add a tablespoon or two of peanut butter to these, which make them divine!! Oh Julene, you are speaking my language!!! The video was adorable — that kid has a future in entertainment, for sure! !